It’s my most favourite time of the year as it is monsoon season and I am enjoying it to the fullest. This weather makes us think a lot of things. We think of trying monsoon delicacies and also plan out weekend getaways. Travelling is lot of fun in this beautiful weather. I was going through many destinations and then I came across one which has totally taken over my mind and it’s the most sensual and serene place of all time – GOA. So, let me tell you what makes Goa the coolest place ever and what makes it the perfect destination to visit during monsoon! Treat yourself to super amazing and beautiful beaches. Goa boasts of the cleanest beaches in our country which give you cheerful vibes. You can witness the sunrise and sunset and get soaked in the simple pleasures of life. Goa has some of the most fabulous food joints that are sure to serve you lip-smacking delicacies and drinks. Vegetarian people also have the privilege to go to Agonda’s Zest for a memorable food experience. Goa is a place where the Portuguese lived centuries ago. So, where in the country would you have the opportunity of getting so close to the Portuguese culture, architecture and food? December is truly the best month to spend in Goa. It’s Christmas time and Goa is all soaked in festive spirit. Parties are organized to ring in the sexiest festival of the year! Last but not the least, Goa tourism has launched hi-tech, AC buses that connect with all major tourist attractions in Goa. So all you have to do is, avail your passes and enjoy the best ride ever by exploring charming destinations! Well! I don’t think you need any more reasons to fly to Goa. Pack your bags and explore this beauty on earth!! NAVRATRI meaning ‘9 Nights’ is one of the most popular festivals which is celebrated with great pomp and show throughout India. With Navratri 2015 round the corner I can already feel the traditional festival taking a fantastic shape. It is that time of the year when all you can think of is enjoyment and fun. 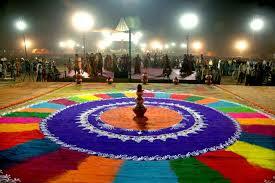 GUJARAT continues to remain the most sought after destination to celebrate Navratri. If you visit Gujarat at this time, you can feel the festive fervour in the state that entices you completely. This is the only place which celebrates a 9-night dance festival, the longest in the world. People gather in huge numbers from each and every village, town and city to seek blessings from the feminine divinity referred to as ‘Shakti’. You find everyone drowned in the sea of divinity, purity and celebration. 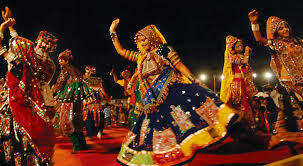 Dressed in ethnic outfits, women sway to the songs while playing ‘garba’ which is a popular dance form of Gujarat. You find a small Goddess shrine erected by every community to mark the beginning of the festival on the first day of Hindu month of Ashwin. The shrine includes a garbo which is nothing but an earthenware pot in which a betel nut, coconut and silver coin are placed. Men and Women, both traditionally dressed, dance around the garbo. Forgetting everything about the stress and pressures, people dance to the classical tunes of songs till late midnight. The dance and music happens after the puja which is performed to worship all the nine forms of Goddess Durga. You will find your soul automatically getting immersed in this divine and pure fervour which is found only in Gujarat. The Garba circles move around the supreme power which is symbolic of power and courage and while performing the Garba steps, you do feel the energy that gradually starts cleansing your mind and soul, thereby making you strong and fearless. I Hope After Reading My Article, You Will Plan A Visit To Gujarat During Navratri For A Spiritual And Memorable Experience! SPAS are the best healing centers for us. They calm our mind, body and soul in a way like no other. In today’s fast and stressful life, we love going to spas which infuse the rays of happiness and life in our soul. Ever wondered from where the salt or mud that is used for your spa treatments sourced from? Well, take a look at the destinations featured below which are your best stop for spa treatments! Legend says that mud is a great healer. Soaking yourself into the mud can miraculously cure many problems and illnesses. Techirghiol, the southeast town of Romania is extremely popular among tourists. Several tourists gather in huge numbers at this spot to get themselves cured as the mud from the lake has been certified by global institutes that it contains therapeutic properties. You must have read many celebrities boasting about their youthful appeal and have often credited volcanic ash mud bath as their secret. Volcanic ash mud baths are believed to keep you youthful and glowing for life. Calistoga has been swathed by volcanic ash left behind due to many volcanic eruptions. So if you are looking forward to a spa treatment that along with keeping you refreshed, also makes you look younger, this city is your ultimate stop. The quiet town of Dalyan in Turkey houses some of the best mud baths in the world. The mud is enriched with healing properties and once you rinse off, your skin feels lively, fresh and exfoliated. So head to this amazing town and come home with a unique and rejuvenating experience. Volcan del Totumo is a volcanic mud bath located near the coastal Caribbean city of Cartagena. All you need to do is just lie down in the mud bath with the mud all over you. The mud, with its healing powers cures you of all your stress and problems. This is also one of the popular spots where you can give yourself a memorable spa treatment. So guys, do plan to visit atleast one of the above listed spots and come home with memories of bliss and peace! !